By hungry runner on July 22nd, 2011 . Filed under: Cupcake Ideas, Stationary . Birthdays are great for so many reasons including cupcakes and gifts. For my next couple posts I will be sharing a few cupcake related items I received for my most recent birthday. To start things off I received a card by Tree-Free Greetings, an eco-friendly company. 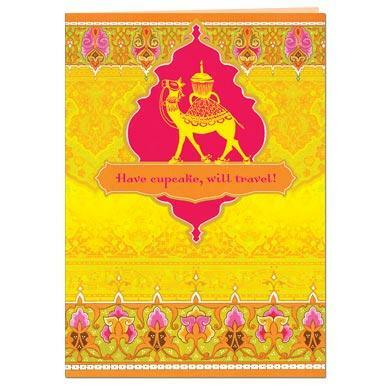 The “Have Cupcake Will Travel” card was made with 50% recycled paper, mixed ec0-paper envelopes and soy based inks were used when printing the paper. If you are interested in purchasing the cards, Peaceful Valley Greetings offers the card for $2.95.